Kihei Resort is located across the street from Kalepolepo, a lovely protected beach which connects to Three Mile Beach, Maui's longest continuous sandy beach, ideal for early morning or sunset walks, swimming and sunning. Minutes from the Humpback Whale National Marine Sanctuary, the lush tropical gardens and peaceful lava rock fountains of Kihei Resort are a Hawaiian oasis. Our ground level condo is designed for your vacation needs. Air conditioned and non smoking it sleeps 4 comfortably. With 621 sq. ft. of living area this condo is roomier than most in its price range. High speed wireless internet, a 42” flat screen TV, and DVD player are included. Your vacation home is situated in a small resort with all of the units facing a lovely Japanese garden; in one corner of the complex is an inviting swimming pool with a Jacuzzi and shower, the other corner has a barbecue area. You are only a very short drive from shopping, grocery, and restaurants. The living and dining area is about 300 sq. ft. with a feeling of spaciousness that welcomes you to make it your home away from home. The living room has an air conditioner and ceiling fan plus a comfortable queen sleeper couch with 3 ottomans that open for storage. The kitchen is fully equipped, including all the amenities a cook will appreciate plus basic spices. The bathroom has been remodeled with tile flooring and a beautiful wood vanity with granite counter top. The bedroom has a king size bed which will provide you with a good nights sleep after an active day at the beach plus a ceiling fan. For your beach excursions, choose from 3 sizes of ice chests, 4 folding chairs, 2 umbrellas, 1 boogie board, 2 sets of snorkeling gear and 4 beach towels. No need to pack a lot of clothes as there is a washer and dryer with soap provided. Located in north Kihei, less than 15 miles from the airport, the location is situated to easily explore the wide variety of all that Maui has to offer. A mile to the south is Azeka Shopping Center and Piilani Village Shopping Center to handle all of your shopping and dining needs. Included are activity centers, restaurants, post office, bank, and medical center. Nearby are a farmer's market, gift and craft fair, and Kalama Village featuring local shops and food. Beyond the shopping is a stretch of some of Maui's best beaches, Kamaole Beaches I, II and III, some of the best body surfing beaches on Maui. Very close by is Wailea, one of the finest turtle-spotting beaches for snorkelers. Whale watching boats leave from a harbor 15 minutes north, just past the bird sanctuary and aquarium. The road to Haleakala Crater starts 15 minutes away. You have a reserved off street parking space when you stay at Kihei Resort. Our calendar is up to date. E-mail or call us to confirm your reservation and secure your Maui vacation. Christopher and I love sunshine, sandy beaches and snorkeling in the warm ocean. We live in Bellingham, WA, the Evergreen State, a lovely state with majestic mountains, many green trees and lots of rain. Seeking sunshine, we have vacationed in the Hawaiian Islands many times and decided that Maui is our favorite island with its many beaches, hiking and friendly locals. We are both semi-retired and decided to buy a condo in Maui so that we could spend more than just a few weeks enjoying the sand, sea and surf. We welcome you to our Maui home and want to help make your stay memorable and comfortable. We invite you to explore all that Maui has to offer, it truly lives up to its common name, The Magic Isle. What attracted us to Kihei Resort was the well-cared for, beautiful garden along with the general pleasant atmosphere of the well designed 64 unit condo complex. The resort is located in North Kihei, which we find quieter and more relaxing than South Kihei. The location lends itself to easily exploring other gems of Maui like Lahaina and Paia. We have one boogie board and 2 sets of snorkel gear for you to enjoy. This was a great condo for us. There was plenty of space for 3 of us, and the location was central to all the activities that we wanted to do. As well, everything we needed for the beach or day out was thoughtfully provided such as a cooler, beach chairs, umbrella. It was definitely a bonus to have a washer/ dryer in the condo. My parents had a wonderful stay at this condo. The condo is clean, updated and well kept. The kitchen is well stocked for cooking. Any questions were addressed promptly. Would highly recommend this condo. Sheena you condo was great as usual. However leaf blowers, pressure washers daily. Not kid friendly kids ( My grandson and some visiting children from Canada) got scolded at 5pm for being noisy ( they were just being kids having fun in the pool) . 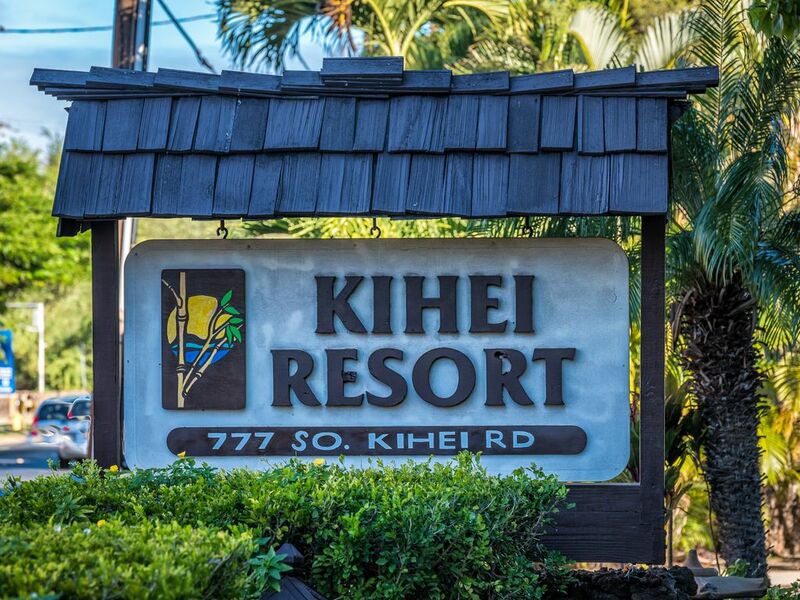 It is called Kihei resort not Kihei rest home. And the neighbors above was something to behold. But your condo was great Shenna. Loved my stay, the people were amazing to work with friendly and very helpful, the area is beautiful and the condo had everything we needed and more. The condo was perfect for us for our one week stay. Clean, comfortable and with a well equipped full kitchen and great shower and reasonably priced. The condo is on pretty grounds. There were lots of extras like beach chairs, towels, coolers and freezer packs, and snorkel equipment and an in-condo washer and dryer. A large grocery is 5 minutes away and there are lots of farmers markets around. A beach is across the street. You will want a car to enjoy the many sights of Maui. Clean, affordable home away from home in paradise! Anyway, the grounds were immaculate and we even met a resident toad eating cat food several times at night (I think the cat and toad were friends!). A giant, beautiful praying mantis greeted us a couple of times on the porch (so neat), but I never once found any bugs inside (which has never been my experience in Hawaii before-- I have always found cockroaches or ants, but not here... super bug-free indoors!). I wish the pool was a little warmer, but the hot tub was perfectly hot, so it made up for it. My son sure loved swimming in the pool after a long hike. Despite all the minor issues, I would definitely stay here again. All the pros make up for the cons. Thank you so much for sharing your beautiful home! Thank you Priscilla for such a positive review along with some good recommendations as well as the comment about the towels smelling like mildew. The washing machine is new and there is a note on the stack dryer to make sure and leave it open after using it to avoid mildew. I have contacted my great cleaning gal about this and she will remedy it. I look forward to your next visit to beautiful Maui. Snorkeling with fish and turtles, body surfing, beach combing. Craft Fair, Farmer's Market, aquarium, whale watching tours, Haleakala crater. Whale and marine wildlife museums, Halloween parade, horse back riding. Bird watching, golfing, canoeing, scuba diving. Astonishing art galleries.